I watched this last night. It's such a fantastic episode. I've said good things about every episode I've commented on so far, but this one really stands out. That scene with Londo and G'Kar in the council chambers is Babylon 5 at its very best. I love all other Londo and G'Kar scenes in this too. The Narn making a tragic mistake in their desperation, G'Kar's inability to do anything about it. Londo's realization that things are quite out of control. That scene of him watching the bombardment is indeed quite powerful. I love everything Draal and Epsilon III. I actually hadn't noticed the 3 miles/5 miles thing or any changes to the interior of the planet scenes. I'll have to pay more attention next time! The Rangers storyline is great too. 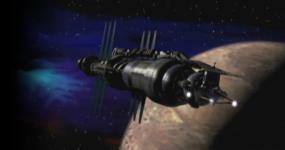 Babylon 5 becoming the Fortress of Light. A line has been drawn! The story of Londo and G'Kar in B5 is probably one of the best of the whole show. In season 1 the two wanted to kill each other, and wouldn't have hesitated given the chance. By the end of season 5, their relationship had developed to the point where you could call them friends. They came to an understanding that both of them cared deeply for their worlds and their people and that they did what they did for that purpose. They actually were able to forgive each other personally for the things they did to each other. I would agree with that. Babylon 5 is pretty great at character development overall, but the Londo and G'Kar characters, and the evolving relationship between the two are really fantastic. I don't think I've seen anything like it on any other TV show... certainly not any other sci fi show. I remember back at the time what always caught me by supprize in B5 was how quickly things moved. In this case I rather got the impression the war was going to drag on for along time, maybe years and be the backdrop of much of the series. I consider myself a pretty massive fan of the likes of DS9 and BSG as well but I felt that along with having a "plan" maybe B5's greatest advantage was that JMS did not drag out his climax's too long. He takes his time setting the scene and building the drama of course but he resolves a plot point whilst the intensity is still at its greatest rather than dragging it over multiple seasons. I'm not sure I would agree with the idea that this is where the real story starts, for me this episode marks the point at which things start to rebound. The downturn in the fortunes of the "good guys" that started at the end of Season 1 and got worse with Coming of Shadows really kicks in during the episodes before this and hits rock bottom with the fall of Narn. G'Kar's response to Londo is IMHO really the moment where things start to turn around as Sheridan highlights nicely at the end of the episode. Last edited by Mororless; April 2nd 15 at 07:57.